INToo viral SaaS ERP and Supply Chain Blockchain Platform revolutionizes business transactions and collaboration. It is ready for your business. Reduce the Initial capital, inventory cost and operation cost. Decrease transaction cost and increase profit margin. Create extraordinary opportunities for businesses to come together to execute transactions with trust and security. Create new Value: by exploiting new business models and eliminating inefficiencies. Optimize Ecosystems: streamline business processes and the exchange of value along your business vertical ecosystem. Reduce Risk by replacing uncertainty with transparency and trusted decentralized ledgers. INToo Solutions is developing business-ready solutions that overcome existing limitations of software technology in terms of privacy, confidentiality, audibility, performance and scalability. INToo ERP Blockchain is the first stage of our overall roll out of blockchain-based applications to cover several industry verticals. INToo ERP Blockchain is a shared journal backed by an immutable inter-related ledgers for recording the history of business transactions. 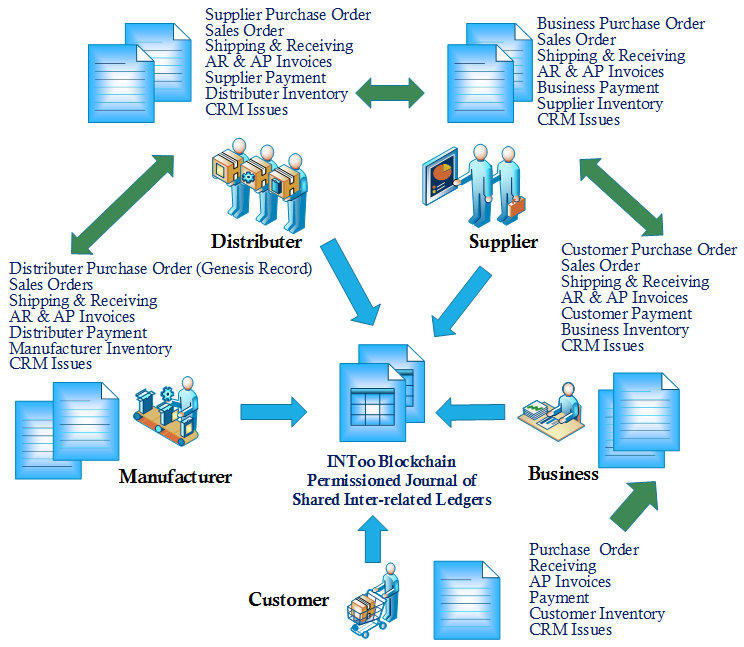 Within this ERP-specific blockchain, the transactions cover CRM issues, inventory items, sales/purchase orders, shipping & receiving, AR & AP invoices, payment, accounting, and job dispatch. INToo ERP Blockchain equips all subscribed businesses with their own permissioned journal of records for inter-related ledgers and their associated contents (e.g. signed contracts) tagged with relevant meta-data. Unlike Bitcoin, there is no need for cryptocurrency exchange: the payment will use normal currency, which opens new opportunities for businesses to utilize an INToo ERP Blockchain financial line of credit to handle purchases that require additional capital. It's free with no time limits for the standard version. Subscribe to start enjoying the benefits. What type of businesses can use eCB? With branded eCommerceBooks web SaaS version, the business application bundle helps telco, ISP, hosting companies and banks to promote and widen their business offerings and increase revenue at a fractional cost of the annual marketing budget. INToo’s intrinsically integrated software applications constitute a consortium of working business data domains. The Blockchain data processing and decisions are largely governed by our business-oriented Artificial Intelligence (Machine Learning), and are hence fully automated and remain inclusively private. 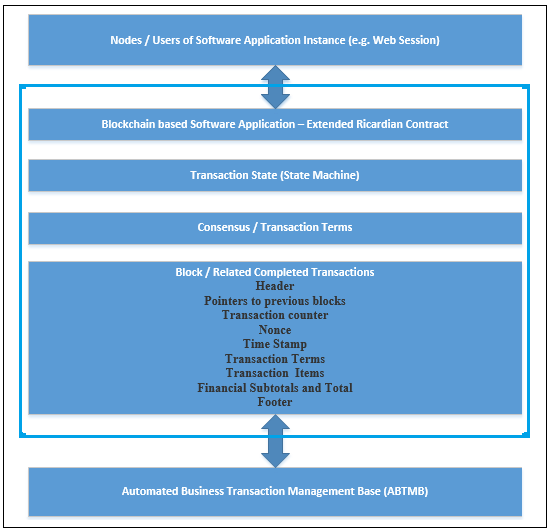 These novel software applications with Blockchain and Machine Learning capability are based on our patentable Automated Business Transaction Management Base (ABTMB) software technology which renders the implementation of blockchain-based software solutions fast and reliable. The implementation of our extended Ricardian contract is part of a private blockchain which includes a permissioned journal which includes multi inter-related ledgers. eCommerceBooks (eCB ERP+ and Supply Chain) is a Viral Software as a Service (VSaaS) and encompasses the first business software application farm with collaborative document communications. All these applications are fully integrated and governed by multi-dimensional workflows to increase work automation and reduce data entry for your businesses. Through Free subscription you can access the rich functionality of eCB ERP+ and supply chain immediately after finishing your subscription which should take no more than four minutes. eCB ERP+ is fully browser based consequently you can access your data (similarly your customers and suppliers) from any simple computer with modern internet browser. (01) Inventory Management with Community Catalog. (03) Sales and Purchase Order Management with Order Consolidation. (06) CRM and Issue Management. Inventory Item List with Search Filter. Easily Add/Update New Detailed Products and Categories. Virtaul POS hence no need for a till machine. Selected Inventory Items for POS. Order List with Advanced Search Filter. Nested List with In-Place Viewing For Order Detail. Multi-Dimensional Workflows: Status, Shipping and Financial. Generate Detailed Orders with In-Place Editing Screen. Wide Range of Order Reports. Inbox and Outbox Shipping & Receiving Notes. Nested List With In-Place Viewing. Generate Shipping & Receiving Notes From Orders. Shipping Notes with Workflow Process. Multiple Shipping Notes per Order. Generate Invoices From Shipping Notes. Invoice List With Search Filter. Nested List For Item Viewing. Generate Invoices From Orders, Shipping Notes Directly. 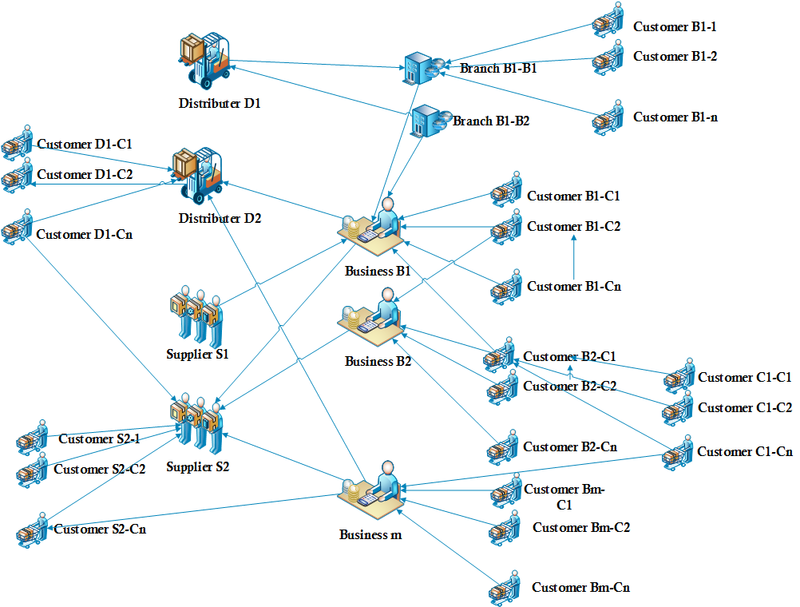 Manage Customer and Supplier Business Profiles. Customer/Supplier List with Shortcut Commands. Projects, Jobs, Work Orders, Tasks, Items and Schedules. Multi-Assignee, Multi-Item and Multi-Schedule Work Order. 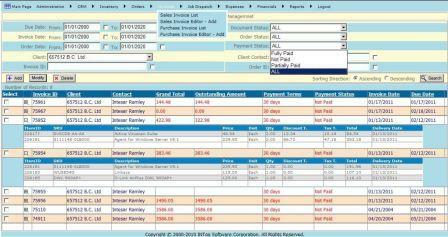 Integrated with Inventory, Invoicing and Accounting System. Invoicing at Job and Work Order Level. Integrated with the Accounting system. You Can Add Your Accounts to the default 40 Accounts. GL, AP, AR, Asset Acc., Expense Acc., Deposit & Bank Acc.,etc..
Tree/Detail Viewing for Account Transactions. Whether your business is wholesale distribution, retail sales, maintenance and services, IT services or a simple coffee shop, eCB ERP+ has more than enough functionality to help you manage your business effectively and with less operational cost and less startup capital to launch a new business. through purchase/sales order consolidation and “purchase what you just sold” features. These features can be executed through clicks and pressing a button on one page. Example: once a sales order is created/received and based on the payment terms, you can generate the necessary detailed sales invoice via a press of one button and at the same time, a purchase bill will be sent automatically to your client. eCB ERP+ helps you to manage the full cycle of job dispatch, from: job creation, assigning (of your or your subcontractor engineers, materials, schedules and locations), changing status, closing and invoicing. There are many useful reports that you can generate to review your engineers’ utilization (revenue and billable hours) and queues. (1) Issuing login profile: Once you add a record for a partner (client or supplier) to your eCB account, the system allows you to issue a login profile for this new partner. Through this profile, users on the client’s side can login to eCB to issue purchase orders (plus other business activities) that you will receive as sales orders; your suppliers will use the profile to login and receive sales orders for the purchase orders that you issued to them. (2) Business document communications between your company and partners (HQ, branches, customers and suppliers). With this feature, documents (orders, invoices, issues and jobs) propagate automatically to your partners (customers, suppliers and branches), based on the built-in workflows. As a result, you do not need to email or fax the sales or purchase orders to your clients or suppliers respectively. Administration: You can manage your own company’s user profiles and their access to the applications. You can also manage your partners’ profiles (addresses, currency, tax profile, contacts) who are within your subscription as long as they don't have their own independent subscription. Smart Views: All eCB ERP+ management screens are equipped with smart views that consist of advanced search filter, drill-down lists with color status indicator, document full content view or editor to minimize your navigation efforts. In Place Editing: All eCB ERP+ editors are one page editors, equipped with all the necessary “call-buttons” to pop-up the required dialog to enable you to add, edit, view or select items to complete your editing work. All calculations are done automatically. What makes our solution a viral SaaS is the built-in default ability to communicate and integrate between the subscribed businesses without the need for any programming or particular tool on top of the internet connection. Consequently each business can establish its own trading-community. There is a choice of setting up a ‘closed’ or ‘open’ community from the configuration module. If you select ‘open’ community then you will be part of the global trading community and your products will be part of the global directory. This open community feature empowers subscribed businesses to communicate and integrate with their business partners (clients, suppliers, branches) using clear & easily identified structured business data, instead of unstructured communications using email and attachments. The open community feature allows business data to flow automatically among modules and all parties involved in a transaction, also providing reports on business activities effortlessly. Copyright (C) 2003-2018 INToo Solutions Corporation. All Rights Reserved.